1956 Butterick #7901 vintage sewing pattern, misses' slim skirt and jacket, plus size 16. 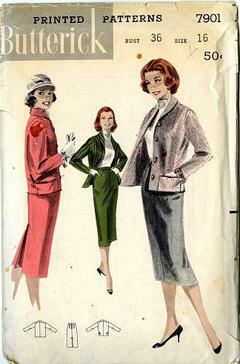 Perfect pair - a slim skirt and jacket, both without side seams, that can be worn as a suit or as sport separates. Jacket has a modified shawl collar, long sleeves and optional buttoned-tab pockets. Skirt has back inverted kick pleat.